Week 2 started with the continuation of the floor and painting the paneling and walls in the basement so I wouldn’t have to look at dark brown for the next year or so while we live down there. I think the day I used the floor grinder had to be the longest day in history. I think I was attached to it for an easy 11 hours. I was grateful that the dust was not billowing up everywhere and that the adhesive came up fairly easily. The grinder was slow going. 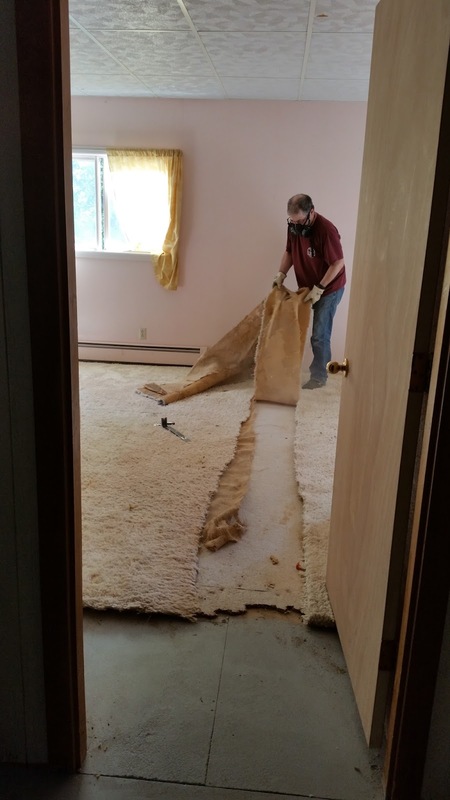 It had diamond stones that literally removed the adhesive and remaining rubber carpet backing and spit it across the floor in a solid chunk. The most frustrating part was that the grinder would turn off occasionally and have to cool off before I restarted. It always seemed right when I was getting into a good groove. I figured since the previous owners left three gallons of white paint I might as well use those on the walls. First I put a thin layer of primer on the walls then shook the cans of paint and stirred them and stirred them. This was the thinnest paint I have ever used. It was also had the worst coverage that I have ever seen. I refuse to go back and put more paint on walls that we are going to rip out in a few years, SO it is what it is I guess. Priming the floor went fast. The nook where a woodstove used to be sucked a lot of primer- I think it was completely unsealed concrete. The well house room (otherwise known as the “murder room” by my daughter Tyler) also sucked up a lot of primer. The primer was like foggy water (Behr bonding primer) but had great coverage. Kirk and I were both surprised that one gallon covered the whole basement. Even primed the floor looks better than it originally did. Tomorrow I paint. I managed to get the paint down in a few hours the next morning. Tyler came and helped me by pushing around my paint tray. We used 3 ½ gallons of the paint, quite a bit more than the primer, but the floor looks great. 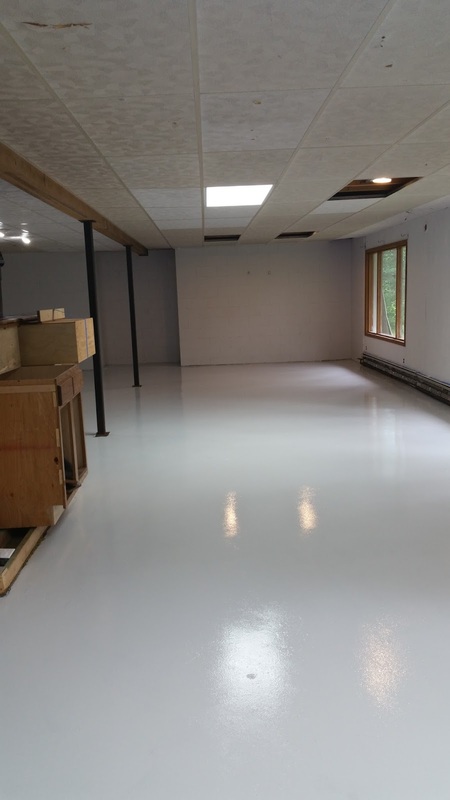 We use the Behr Concrete and Garage 1-part epoxy. I’ve never used this so hopefully I don’t scrape it off when I drag stuff across the floor. 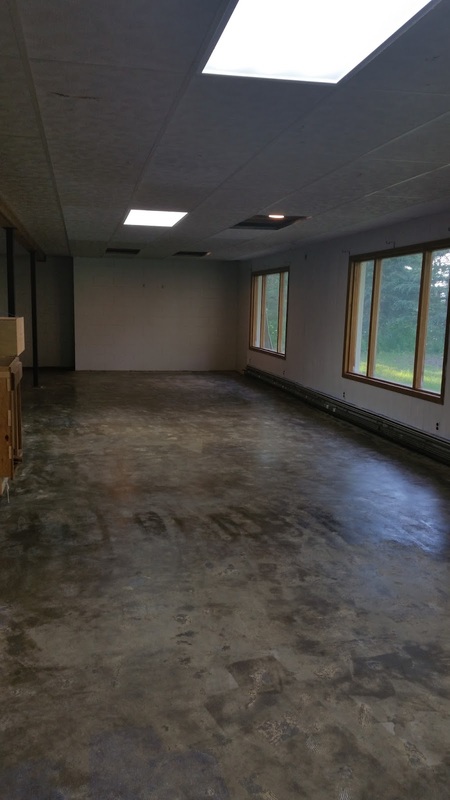 The extra effort to grind the floor before priming and painting was worth the time and money. Sunday morning we decided that clearing the road to the lake sounded like a more entertaining project than dealing with the inside, but for some reason Kirk started on the carpet in the upstairs bedroom. Probably one of those “squirrel” moments when you see something and completely forget what you were going to do. 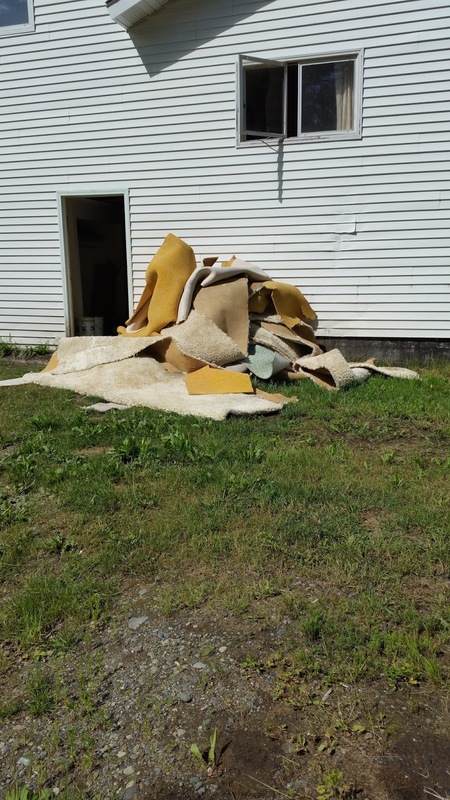 I think that the carpet that we pulled out of there was all original 1972 with the exception of one room. 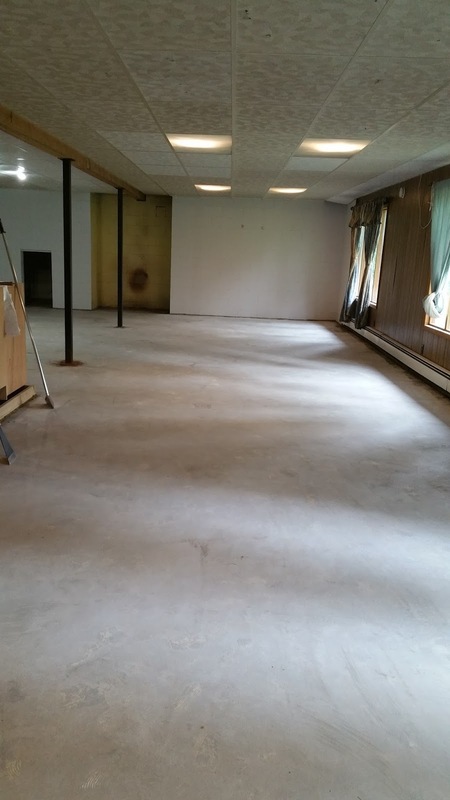 The subfloor is horrific in a few spots. It looks like many years of animals lived in these rooms. 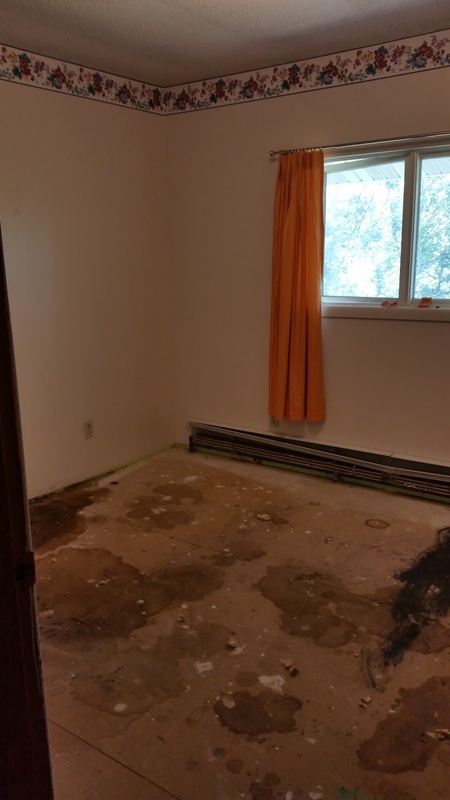 The carpet in the master bedroom literally disintegrated in our hands, and the smell………..It's a good thing we were wearing respirators and masks. We will have to pull out a lot of the nasty subfloor that has animal damage. :( yuck. We had a showing scheduled for our old house on Saturday, so we decided to spend the afternoon at the Suzanne house with the dogs. We thought it would be good to introduce them to their new space. I think for the most part the afternoon went ok. They ran up and down the stairs, sounding like a freight trains each time, Chassis in total doggy heaven. Paulie(the German Shepherd) decided to mark his territory in the basement after which chaos ensued. Paulie was in trouble for lifting a leg on a post, so he was hauled outside. Chassis seems to think that if he is out she should be too, and went bezerk trying to get outside. The whippet is thankfully deaf and completely oblivious. We are in serious need of a dog containment area. We need to put that at the top of the list. Once things calmed down Kirk got to work destroying the kitchen cabinets so we could get the counter off to use in the downstairs temporary kitchen. Turns out the counter was built better than anything else in the kitchen- probably the whole house. Who would have thought. We would have tried to save the cabinets but there was no getting the counter off of them. Oh well. We have cabinets for now. And a few to spare.